If you’re anything like us, you thrive on BIG ideas. We should repaint the cabinets. We should replace the master vanity. We should create a calendar for the kids’ chores. The key is following through on these big ideas. In an effort to make our lifestyle as clean and green as possible, we have lots of these ideas. Watering the yard less, switching out all the lightbulbs and maybe not cranking down the AC as much during the summer. Alright, that last one is pretty hard, but we’re trying! 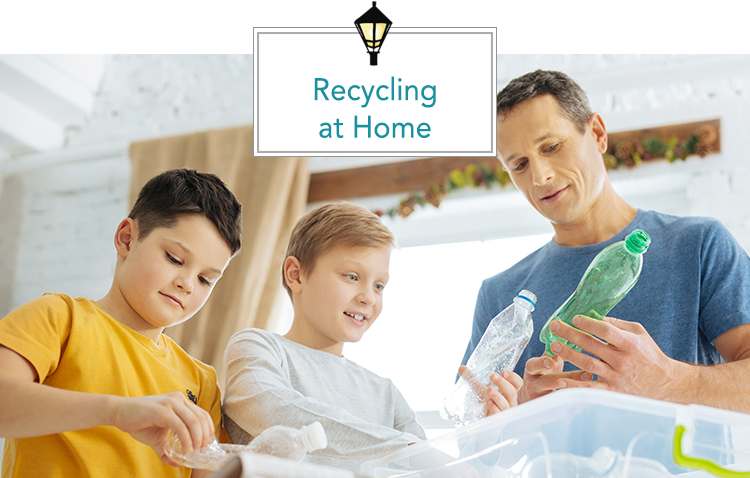 Another BIG idea that we are committed to seeing through is recycling at home. Did you know? The EPA estimates that 75% of U.S. waste is recyclable, but we only recycle about 30% of it (sad!). Another fun fact from DoSomething.org is that a glass container can go from a recycling bin to a store shelf in as few as 30 days (awesome!). This is a good time to teach our kids (and our spouses) the merits of not wasting and recycling. So, join us in going green and following through on a BIG idea by learning how to start recycling at home! So, we apologize in advance for assigning another homework project. We promise it will get fun soon, but this is important! Over a week or two, take note of what kinds of trash your family/household throws away. This way, you’ll know what you’re discarding and what you can focus on recycling. For even more help, check out this list of the ten most important items to recycle at home. Like we said above, we want to actually follow through on this green idea. So, let’s make it as easy as possible on everyone involved. This means picking a spot in the house that is easily accessible and won’t be forgotten. Now we’re getting to the fun part. If your county/municipality doesn’t offer standard-issue containers, this is your chance to make this project look good! Whether it’s sleek, black bins, antique copper baskets or an Amazon all-in-one special, pick the bins that make the most sense for your home’s looks and needs. Once you have the bins, take it one step further and add some super cute labels that will help your bins function and look better. Ok, we’re back to that whole following through thing. First of all, we believe in you. You can start recycling at home! And to help, let’s create some guidelines for your home. Make a list or a fun graphic about what you are recycling, when to throw things away and when the recycled items will be picked up or taken away. Click here to download and print our printing labels.